This room is located on the 2nd floor and has a King Bed . Located off route 1, 2 miles off exit 81. 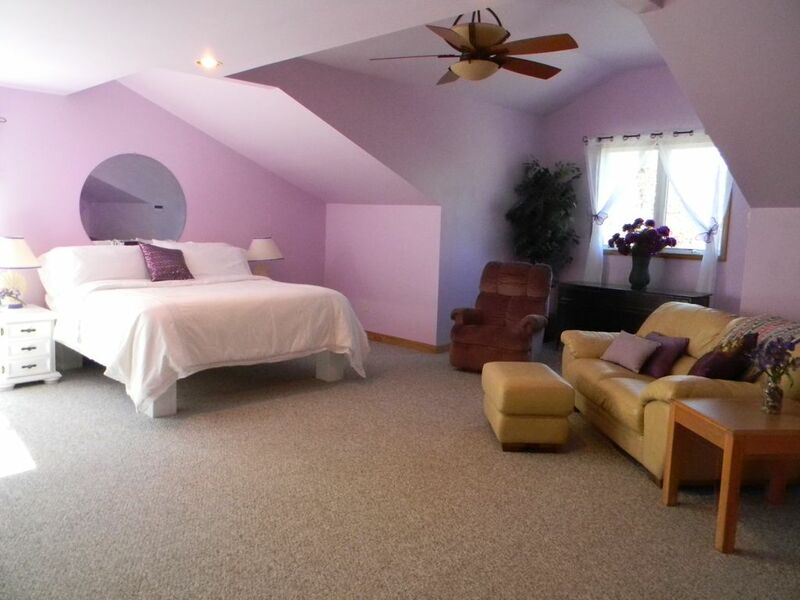 We have 3 Private, Beautiful, bedrooms with each having private bathrooms and shower. Each Bedroom is listed separately on HomeAway. Our home is located a 1/2 mile from Jordan Lake, on 4 1/2 acres of complete serenity. Upon your awakening, you can enjoy a hot, cup of coffee, tea on our large covered front porch, or on comfortable chairs under roof on the back porch. Room with full breakfast included is $150 per night, and breakfast will be served at 9:00am. Enjoy some time relaxing and enjoying our private back yard, listening to the wildlife. We have 2 beautiful, over-loving Boxers that patrol the grounds. Please note: 2 adults per bedroom. Rooms are $150.00 per room which includes a full home cooked breakfast. My husband and I have been married 40 years and met in high school. We grew up in Pennsylvania. We have 2 wonderful children who are now all grown up. We have 2 beautiful Grand-daughters, which were my inspiration to name my rooms, (Isabel & Ana). We designed and built the home ourselves. My husband did all the wood work, including the beautiful spiral staircase. We purchased the property because we both were raised in a country setting and enjoy being outdoors and like the serenity this area provides. We have seen, white albino deer, fox, possums, owls, all while sitting in or outside our home. One of the unique benefits of staying with us, is the space you will have while you are here. We built the home to be spacious, and the outside to be comfortable and fun. toilet, shower, both bathrooms have walk in showers. each room has their own thermostat to control their ac/ and heating. Ample parking beside the B & B.
large dining room table sits 8 guests. We also have a sitting room, where 2 guests can sit alone for privacy. Covered back porch with comfortable furniture. We are here to make your stay as enjoyable as possible. Hope you enjoy your stay in our home. Overall great experience. Spacious room, great service, friendly owners, wonderful breakfasts. Highly recommend. Thank you so much for the wonderful review. We Loved having you and are so happy you enjoyed your stay. We hope you come again. Safe travels wherever your map may lead you.